The McGavock Confederate Cemetery is the largest privately held Confederate cemetery in the United States. It is located in Franklin, Tennessee. The nearly 1,500 Confederate soldiers buried there were casualties during the Battle of Franklin that took place November 30, 1864. 780 of the soldiers’ identities are known today, leaving 558 as unknown but not forgotten. Rest well boys. Your work is done. This first version is cemetery footage set to Going Home by Mary Fahl (lyrics). This second one is footage of the cemetery set to Shenandoah by Van Morrison. Please leave a comment (scroll down to version you like more and why. Thanks. Learn more about McGavock Confederate Cemetery. I live just a couple miles from the cemetery. I find myself out there 2-3 times a week usually. I love going out after dinner and watching the sun set. McGavock Confederate Cemetery is a very peaceful place for me. I know the carnage and many of the horrific stories of how these young men got here, but still, there is a peace about the cemetery, with Carnton in full view, that has always yielded a sense of peace and calmness for me. I even enjoy staying past sunset and walking around in the dark evening hours. I am working on a guide to the cemetery for non-Civil War buffs that will be finished very soon. I’ll keep you posted. One of my favorite things is to be walking around the cemetery as I’m studying or photographing and inevitably strangers will walk up to me to ask what I’m doing. I almost always provide them with a free 20 minute tour of McGavock. Please comment on your experience of the cemetery on this page after you’ve visted. Very well done! Informative and emotionally moving. What you are doing in this regard is highly commendable and extremely valuable. My wife and I will be visiting the Nashville area in mid-September. I will definitely visit Carnton and McGavok Confederate Cemetery. I am the descendent of Confederate war veterans who fought in the Virginia Regiments with General Lee’s Army of Northern Virginia. I have had a long time interest in “The Cause” and never pass up an opportunity to visit places such as Franklin/Carnton/McGavock. Your work with this blog will make the journey all the more worthwhile and increases my anticipation. Thank you. You are truly a special individual to do the work you do. I hope very soon that my personal and professional life will permit me to assist in the cause that you so admirably take up. I have visited 2 battlefields, Parkers Crossroads and Shiloh, and soon visiting Franklin. Your efforts alone to keep this fantastic website running and with the vast information that you have gathered here is greatly appreciated. I live in Huntingdon, TN, and plan on visiting soon. I have just begun reading “The Widow of the South” by Robert Hicks. My dad always told us stories about the War. We visited Vicksburg and many of the battlefields. He was very much interested in the history. After he passed away in 2000, I began my genealogy search. This, of course, lead me to Civil War Archives. I put the research aside and became so interested in diaries, stories of individuals, the prisons; I began to read books suggested by friends. I am totally fasinated. I would like to learn more about Franklin, Tennessee and the McGavock Cemetery. If anyone could suggest other books, I would welcome correspondence. 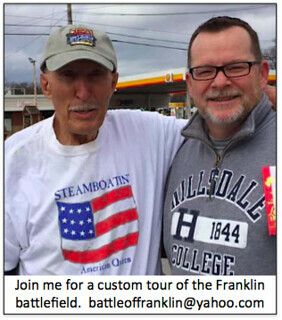 Since my husband and I are retired, I would love to make a trip to Franklin soon. We live in Sugarland, Texas. I was born in Pensacola, Florida, however. My maternal ancestors are all from Mobile, Alabama, Baldwin Cnty, Clarke County Alabama and Clarke County, Mississippi. I need to browse the site and see when the events are scheduled. Carol Young – I would recommend the book by Winston Groom about the Western Theatre of the Civil War. The name has slipped my mind at the moment. But after reading it I didn’t have much respect for General Hood and thought he was quite reckless with many men’s lives. My great great grandfather fought at Franklin in Tennessee’s 28th Infantry and lost his left arm right up to his elbow in the battle. His obituary says something about it didn’t stop him from doing anything but tying his shoes. Great job, we just out there yesterday (Oct 26,2008) and walked the cemetery. Very beautiful area and well preserved. at the Battle of Franklin. Just so you know this battle took place on November 30, 1864 lasting that afternoon form 4 p.m. until 9 p.m. I have in my possession a book listing all the men and their brigades who fought in that battle and are buried at Carnton Confederate Cemetery. There were many men from Mississippi who were killed but un-identified; however, there was a soldier from Mississippi with the name of (John H. Dyess). He was in the 8th MS regiment Co. D of Lowrey Brigade. This mans grave can be found in Section 31, No 139 of the Mississippi section of the cemetery. I don’t know if this man is of any relation to your family, but thought it worth telling you about. It is s beautiful cemetery, I have been there and it is definately on hallowed ground, near the Carnton home. I also have ancestors who fought there with the Confederate Army of Tennessee. I hope this has helped you with your seeking information on your ancestor. I looked and could not find that soldier’s name in Jacobson’s book; the McGavock Confederate Cemetery. However, there are quite a few unknowns listed in the Mississippi section. He could possibly be buried at McGavock, just unidentified for now at least. I read you post from Jan 31, 2010, which stated that you had a list of all the men that fought at the Battle of Franklin and became very excited to hear. Im looking for a list of the confederates in the 29th Tenneseee Regiment who fought at the Battle of Franklin Tennessee on Nov 30, 1864. I just ran across 13 members of the Regiment who were killed in the Battle. But there seems to be one man listed who wasnt on the Muster Roll of the 29th. Can you share with me the list of the men from the 29th Tennessee Regiment who fought at this battle. ?? Steve: If you are talking about our George W. Dyess – he is buried in Stewart County (Webster) Georgia. Thanks! I found this site out of curiosity while reading yet another historical fiction work re: civil war, entitled ‘The Black Flower’ by Howard Bahr. Carol Young: while I have only read half of this first novel of his series, I would highly recommend it to you. Howard Bahr is remarkable in his research and haunting writing style that very much places the reader into context of this horrendous battle. Both versions are beautiful, but I have to say I prefer the Going Home version. The words and music just seem to fit the sight of the cemetery better. My wife and I just visited Carnton Plantation for the second time in 20 yrs.Alot has changed since our first visit.Carnton and the cemetery are truly Historical treasures.I would like to know more historical facts about Carnton,such as where were the stables or coach house located.?? Are there any slaves buried on the property.? ?What if anything has been found in Excavations of the grounds? ?On our tour,the house was dark inside.I really think more light needs to be let in.I to like the “GOING HOME”. version better.I’m reading the book about Carrie now. What a caring and beautiful lady she was.She”s resting in peace with her boy’s. I have a passion with Carnton. My GGfather was born there. That place is special. I want to go back to see it now that its all fancy. Your great grandfather was born at Carnton? My grandparents were the sharecroppers who lived in the mansion during the 50’s and 60’s. My grandmother was a meticulous housekeeper; left the house in pristeen condition, not like the Carnton tourguides say. It was fancy when my grandparents lived there. Now it is just a tourist attraction. I do not understand why my great, great grandfather is not listed as being buried in the cemetery. He is buried in the Mississippi Section #39, grave # 265, 30th Mississippi-Brantly’s Brigade. My ancestor is Dr. Joseph F. Smith or J.F. Smith. How can he be added? This wonderful man was a doctor and also gave his life for his country. Is there a way to replace markers that are difficult to read? My reenactment unit is interested in our company’s captain who is buried there (Co I, 3rd & 5th MO Inf). Both videos were beautiful and moving, however I like “Going Home” the best. I just found out last year that my gg grandfather, Asa Minor Laney, was killed at the Carter Cotton Gin and reburied at the McGavock Confederate Cemetery. (Row 25, #51.) It was my great honor to have been able to visit the cemetery and tour the beautiful Carnton last week. Equally as great an honor to have Eric Jacobson actually take us on the tour of the beautiful McGavock home and present a riveting, beautiful narrative of the events as they unfolded there. I can tell you that I actually got “goosebumps” standing in the home and listening to his story – you could close your eyes and easily imagine the scenes of the war taking place inside the house. The grounds and the cemetery are beautiful beyond words. I felt such a peace standing there among those brave and tortured souls’ graves, knowing they also were at peace to have been so well cared for. Everyone who has ever had anything to do with the preservation of Carnton deserves a deep heartfelt “Thank You”. Ms. Shelton: The other Confederate Soldiers you inquired about in Row 25, Grave # 61 is Pvt. James Joseph Lammey, Jr. age 23. Elaine, I live down the road from you in Rusk and I’m planning a trip to Franklin soon. My ancestor, Pvt James F. Stingley. Co G, 30th Miss, died from wounds on Dec. 22. He was at Boxmere, a house on Main St in town. There is no record of him at McGavock, however. Since it was 3 weeks after the battle when he died was he taken there and put in the unknown section? Surely since he lingered for 3 weeks before he died people would have at least known his name. Or was he buried quickly someplace closer in town since it was the beginning of the yankee occupation of Franklin??? Hopefully I can find the answers. I’m looking forward to at least seeing the actual house where he died. Asa Minor Laney was also my gg grandfather. I will be visiting the cemetery this month and am so looking forward to it. I didn’t know much about him just that he left a newborn baby, my great grandfather. Do you have more information on him? I just reread my reply and don’t know why I put that he only left behind three children. Of course, he left behind four children, your g grandfather, Asa Minor Laney, Jr., my g grandfather, David Ervin Laney (the oldest child) and two daughters, and his wife, Nancy Laney. I hope you enjoyed your visit to Franklin. It was quite an experience for me. Elaine Shelton, Whitehouse, Tx. I too am descended from Asa Minor Laney. Through his daughter Nancy Georgiana. Would love to hear from family. I’m reading Widow of the South, and can’t put it down. I live in Franklin so this battle in Franklin and the Carnton Plantation is just so interesting. Can you explain something for me, please? Carrie and John had a son, John Randal. On page 81, in the paperback cover, it mentiones that John Randal was three months old when he died, the picture of him with his two sisters shows him much older. Then when Carrie was going through pictures she comes across one of John Randal as a baby, not sleeping, but dead and says that it’s the only picture she has of him. Please explain the picture of John Randal with his sisters on page 414 looking to be around 3 or 4.
of peace in spite of being in a place where so many victims of terrible carnage were buried. Reading about war had never bothered me until I read “Widow of the South” and learned how the tactics of war at that time insured that many many men would be killed. The cemetery is a reminder that in spite of the horrors of war, there are people like Carrie McGavock who tried to do some good by making sure that young men were buried with their own. The cemetery is a hallowed place and all generations of Americans who visit it should come away feeling proud of the young men buried there and all young men who have given their lives in all wars. Would someone be kind enough and send me a picture to this e-mail address of the tombstone/marker for: section 39, grave 265 for Dr. J.F.S. I was able to get a picture of the monument #424 for the Mississippi section, all I need now is a picture of the small marker. I live miles away and cannot come up there. Very nice videos. ‘Going Home’ by Mary Fahl is especially moving. I have always been fascinated by the Battle of Franklin. I find it such a tragic and horrendous battle. I would highly recommend to you the novels by Howard Bahr- ‘The Black Flower’, ‘The Year of Jubilo’, and ‘The Judas Field’. The first and the last are especially evocative about the Battle of Franklin and the meaning of the war to the South. I had ancestors who were in the 3rd Mississippi which was really torn up during the battle. The brave soldiers from both sides who fought and died at Franklin should never be forgotten. My wife Cheryl and I were visiting the McGavock cemetary in May 2009 on the way back home from my 5th Vietnam 2nd Batt.3rd Marine-Hotel Co.67-68-69 reunion in Quantico,Va.My relative Jackson Hawkins Griffin-Texas 25th calvary was killed within feet of the Carter House.Could not find his headstone marked but felt I was near where he lay.Since my cousin Thos.Griffin has located a letter he sent home to Liberty,TX.to check on his children left in care to J.H.Dever just a few months before his death.Jackson Hawkins Griffin fought in the Texas Battle of Indep. @Bexar And Constantine and was on a 9 day furlow to check on his family when the battle @ the Alamo took place.He helped found and build the log cabin Methodist Church in downtown Liberty,TX the site of the current newer church.There is a state of Texas Historical marker @ the homesite area-Griffin Cemetery now Cooke Memorial Cemetary owned by the Methodist Church he helped found.Jackson Hawkins Griffin was chief justice(presiding judge of Liberty County) and enlisted @ 44 yrs.old under Col.Pickett.of Liberty,Tx.We will be coming back to this beautiful and peaceful cemetary again soon as we are gathering more info to share w/the caretakers and the staff who share all their knowledge. Robert: If you wish a copy of an image of Jackson Hawkins Griffin and additional information, please contact me at tburgess2@hotmail.com. Great blog. Informative comments and beautiful video. I just read “The Widow of the South” and it intrigued me to find out more about the Battle of Franklin. Something about the story of the battle that is so compelling and left me with the feeling to find out more. Hope to visit the Cemetary and Carnton in April . So happy that it has been preserved so the story can live on. Does anyone know if Walker’s 2nd Tenn. Inf. fought at Franklin? My wife’s ancestor was John T. O’Malley ( or O’Mally), and we know he fought at Corinth and maybe Shiloh, but that fighting unit was morphed, like so many others in the armies, into other units as time and casualties mounted up. You pple who write on these blogs are so important to keeping our country’s historic heritage — and especially Civil War — alive as the years since the war seem to spin faster and faster away. Keeping the legacy alive is so important. I’m hoping the upcoming 150th anniversary celebration of the war will have some great things attached to it, if the politically correct liberals can keep from watering it down too much. I was just a kid for the 100th back in 1961-65, but I remember lots of great books, stamps, etc., to come out of it. Thanks for this site. My 3rd great grandfather 2nd Lieut. Robert B. Hendricks, 42nd Tn Infantry, fought and died at the Battle of Franklin and is buried in the McGavock Cemetery. It is a beautiful place. got to visit July ’09. Loved it but what’s up with the big white fence obstructing the view from the cemetery to the house? I am looking for any additional information on James Wilson Winn, died 1 Dec, 1864. I saw his tombstone on this site. Thank you for keeping the boys of Franklin in our memories. I am a Storyteller, and I am putting together a composite story about James Winn (Confederate) and Hugh Millhollin, Jr (Federal). Both boys died at Franklin, both were just 16 years old. Ms Hood, did you ever receive a photo of your kin there at Franklin?? My name is Michael Studer and I live just South of the Bama-Tenn line and would be honored to send you a photo if you are still looking for one. My family and I visited the cemetery in July 2010 and found it very moving. I recommend the superb 6-minute video, http://www.youtube.com/watch?v=84xa8xh5p3k, which I wish we had seen before we went. My father’s side of the family is from Byrdstown TN, about 90 miles NE of Nashville, and my son lives in Spring Hill. My great-grandfather, at a very tender age, fought for the Union as most did from Pickett County. I currently live in Minnesota and people here know little of the Civil War. I am currently reading The Black Flower by Bahr, a marvelous mixture of humor and deep grief. It brings the battle, and the tragedy it represents, back for us to experience. To take in the wealth and malls of current-day Franklin without going to Carnton and the Carter House would disrespect all those who died, from both sides. To visit the Confederate Cemetery deepens the soul and makes all this very real. Not to be missed. I am trying to find information of Andrew J. Lucas of the 12th Louisiana Infantry. Reported as killed Nov. 30, 1864 and buried at the Carnton Cemetery. Could you please tell me if this name is listed in the records you have? Is there a published list of casualties of this battle or a published list of those buried in the McGavock Cemetery. Thank you for your help. 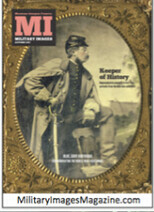 E. I have search the available listings and all of my research re: McGavock Confederate Cemetery. Did not find a listing of a grave for Andrew Jackson Lucas, Co. E. 12th Louisiana Infantry. However, since almost 1/3 of the graves in this cemetery are Unknowns that does not mean his is not buried here. His service records ends in August, 1864. Also, on August 1, 1864 he was on detached duty to the “Pioneer Corps”, no further record. As I was going through boxes I found a book “Record of Names Confederate Cemetery at Franklin, TN” This is a book my father had left me when he passed. It has stories and names about the men who are buried here and I want to learn more about this book. It is addressed to the United Confederate Veterans of Missouri and to the best of my knowledge it is a second copy hand written and dated by Mrs. A.B. Dozier September 1910. Can anyone tell me what I have and what it means? This is an excellent site. Thank you. I live in Wisconsin and my wife and I are visitng Franklin next week. I’ve been there twice before but I can’t wait to show her the battlefield and cemetery. My great great grandfather’s regiment (40th Georgia) fought at Franklin, although he didn’t because he had died the previous year at Vicksburg. It’s always a moving ecperience visitng the cemetery. Thanks again. Have been to Franklin and visited the cemetery. Beautiful and thought provoking. At the time was not aware of two relatives who had perished in that futile effort. One is buried at Cedar Hill between Nashville and Adams in Tenn. The other George W. Bell Company “E” 29th Mississippi, Inf. may be buried in the unknown Mississippi section. Do you have him listed in your book? His full name was George W(ashington) Samandal Bell, and yes, he is a direct descendant (as am I) of John Bell of “Bell Witch” fame. Keep up the great work, we’re coming back to the plantation and the cemetery possibly this year. One of my Great Grand Uncles, Charles N DeVall of the 8th Mississippi is buried at McGavock. I am so grateful that you are doing so much to preserve the history and stories of what happened in this hallowed place. Just doing a little family ed. with my kids and thought i would drop a note . the carnton plantation was very well kept thnxs to people like u . We donated alarge rose bush from tx they were supposed to put it by the cemetary. did it make it? My great, great grandfather fought for the confederacy in the Battle of Franklin, died and is buried there. His name was Micajah Pickett Stevens. I’d love to know if he has a marker on his grave. I don’t know which cemetery he is buried in. Is there a listing of all the graves with headstones in the cemeteries in Franklin? Any info would be greatly appreciated. I hope to visit in your area someday. Thanks for your devotion to preserving such an important part of our history. Hi Karen, I’m Connie English, also the great great grandchild of Micajah Pickett Stevens. We happen to be visiting Franklin TN today and just saw your post. Micajah is buried in the McGavock Cemetery In the MS section. They have him listed incorrectly as N. P. S. This has been clarified. The section is #40 Mississippi Plot 282,(Close to a large tree). My sister has done research on our family and we too have been to Yazoo City, MS. doing research. We came many years ago to a Descendents Reunion of the Battle of Franklin and while checking the internet tonight, I noticed there might be another reunion in 2014. My wife and I are hoping to come again. You might find the webpage and sign your name on it also, so that they can get in touch with you. My Great, Great Grandfather fought, died and is buried in Franklin, Tn He was Micajah Pickett Stevens; pvt, Color Cpl, Color Sgt; I/F-S; 3rd Regt. He left his surviving children, including my great grandfather Frank, with his in-laws in Yazoo City, Mississippi to fight in the war. His wife died shortly after childbirth in 1861. One of Frank’s sons, my father Julien R. Stevens’ dad, Hurd M. Stevens lived the majority of his life in Leesville, La, were my 4 siblings and I were born. All but Julien, Jr. have moved away from there. My sister and I traveled to Vicksburg and Yazoo City last week searching court documents for any information on ancestors. We hope to go back soon, it’s very interesting and our curiosity has been tweaked to learn more!! my relative david riley bevins (kearney, clay co mo) was 19 when he died at franklin. he is in the mo section #119. i was able to visit the cemetery last year and was moved by the beauty of the setting. i had known for years that he died at franklin but had no idea his grave was known or marked. I am completely fascinated with the history surrounding this area. I moved to Tn in 2004, & I love the fact their is history almost everywhere you go in this Metro area. I live in Columbia, Tn & love to go out and take photos of Plantation homes and family burial sites and such. This will be my first time coming to the McGavock cemetery since moving here. From your videos, I already have tons of photo shots in my head, could possibly spend the day there looking and shooting pictures. I lived in Yorktown, Va prior to moving here and I have to say, I have lived history for almost all my adult life and it is wonderful to be just on the grounds of where these men fought and died, same as in Yorktown, there is something that still lingers from all the years gone by even. My friends think I am crazy but just walking the same grounds as these men I feel honored to walk in their footsteps & get to come to a wonderful place such as this to pay my respects, for what they gave for their cause. I subscribed to your blog, in case you add anything new. Please feel free to email me. I am about to head out to the cemetery now, I bet it is just gorgeous at sunset. Thanks for sharing this piece of history with everyone. A really wonderful website. Thank you very much for doing this. I please make a request? My gggrandfather was killed in the Battle of Franklin. His name was Mathew Andrew Dunn, Sergeant, Company K, 33rd Mississippi Infantry, Featherston’s Brigade, Loring’s Division, under Stewart’s command. I think he spelled Matthew with one “t”, as I recall. I have read the letter from his Captain, Capt Anderson to my gggrandmother describing his death at Franklin. Is he listed in the cemetery? Or is he perhaps one of the anonymous Confederate dead? Shortly before my grandmother (his granddaughter) passed away, she went to the battlefield to see where her grandfather had died. She never found out, and passed away years ago, assuming he was buried in a mass grave somewhere and forgotten. Your help would be greatly appreciated. Thank you so much. my name is Alfred Farris. my grandfarher James Barton Farris joined the 7th Alabama regiment company H at age 16. he later joined the 10th Tenn. compan H. he fought in the battles of Franklin and Nashville. he was captured on Hood’s retreat and taken (i think) to Rock Island ill and was then moved to another prison where he survive smallpox. i would like more information about his war and prison record. Where would I find a list of soldiers buried in the cemetery? My G-G-Grandfather, William H. Edwards was in the 6th Reg., MS Infantry (also called 7th Regiment. I haven’t been able to find when he died or where he’s buried. George Riley Cannon the Confederate from Missouri 1st brigade Company C was the Great Grandson of Colonel John Cannon who served in the Revolutionary War from Canonsburg, Pennsylvania. In April of 2001 my husband and I visited the grave of George Riley Cannon. His gravestone is marked Lt. C. I knelt down by his grave and I was moved to tears as I silently said “I wish I could have known you Riley.” I saw a vision above the grave of an emaciated face with bushy hair, sunken cheeks and dark hollow eyes. I believe it was Riley’s face. I immediately started crying. I tried to lock in on the vision but it faded and as my hand was drawn to the ground and I felt like I touched his soul. I believe I was the first person ever in the family to have been there. I had been researching genealogy for years to find out where our George Riley Cannon had died and was buried. He was my 2nd Great Grand Uncle. I knew he was a Missouri Confederate that died during the Civil War. Reviewing your site I found him! He wasn’t unknown after all he had a marker! George Riley’s cousin, also named George Riley Cannon from Ohio was a Union Soldier. He was also there at Franklin, Tennessee during this terrible battle. The cousins probably didn’t know the other was there. Many of the relatives named their sons Riley Cannon after the loss of George Riley Cannon, known by family as Riley. My father’s name is Riley Cannon as well my Brother and his son. Your web site had given me the information I needed to find our lost Civil War Relative. I thank you so very much! Also I am coming back for a visit this year. My gr-gr-gr-gr uncle, David Frederick Williams, was in Company B, 7th Texas, Granbury’s Brigade, on the right of the Franklin & Columbia Turnpike. He was slightly wounded at Franklin, the day after his 20th birthday. He survived the war, and died on March 31, 1917, in Hopkins County, Texas. We laid a flat bronze veteran’s marker at his grave about 10 years ago. My 3rd great grandfather served in the Indiana 125th Regiment, 10th Cavalry, Company A. His name was Lemuel W Bacon. He mustered in 30 mar 1864 and mustered out 26 jun 1865. He was listed as a private. He was enumerated as a physician in the 1850, 1860 and 1870 Indiana Census. I’m not sure he ever served as a physician in the war. Just wondering if anyone can guide me on details of his company, battles, or maybe even photos. My Great Granduncle was a member of “A” company 6th Texas infantry. His name is James W WILSON. I would expect him to have been a part of the company protecting general Cleburne personally. So I suspect James died near Cleburne. Wonder if you know the location where Cleburne died and if James WILSON is an identified Texas private buried at McGavock Cemetery. Thanks for all your work creating this memorial to men who believed in the 10th amendement to the Constitution. My great -grandfather J.C. Rodgers fought at Franklin with the 28th Mississippi Calvary . He was wounded and had his horse shot out from under him but was able to continue to fight untill the end of the war .I went to Carnton and the cemetary this past weekend .In one of my pictures of the cemetary ,it clearly shows a spirit hovering over some of the stones . I had such a heavy feeling in my heart the whole time I was there .It is hard to imagine the suffering and heartache that day and the other battles as well caused for so many. I visited Franklin and Carnton back in Oct. of ’07 after reading the “widow of the south”. My visit was definitely a very moving experience. Carnton is a very beautiful plantation but it’s also a very sad and haunting place when you consider all the death and suffering that went on there. The battle of Franklin was the most tragic battle of the american civil war! First of all, you will never regret visiting Franklin, Tn. It changed me forever. I do plan to visit again. Now, I have no idea where your relative may have been buried, but since he was being cared for at a house in town, and died there, my guess would be that he was buried somewhere there in town. The bodies that were moved to McGavock stayed in their first burial places through the winter, then were moved. I doubt that they would have taken your relative to be buried where the others were bured – literally where they fell and died. Good luck. I hope you find him. There are many folks in Franklin that have a great deal of information that might be able to help you. One of them is a historian who is usually there at the Carter House Museum. He might be able to help you. My husband’s great grandfather, Archer Jenkins Roden, may have been the A Roden, Al, H, 55, 74,97 buried in the Carnton Cemetery. Is it possible to find out any additional information about the A Roden on the index of soldiers? I just visited the cemetery today. Took some pictures while looking at everything. I’m a big history person. But, so far, I’ve only visited Winstead Hill (I think that’s the name..)… The Lotz House… And now, the McGavock cemetery. I’d love to see more places. Also, maybe, get a tour of the cemetery so I can understand more. great reading the blogs, fascinating history, hope to see it one day. I am looking for a long lost cousin who fought in the civil war from Missouri. Beautiful place. Who was the woman from Georgia that helped get the stones? Her last name was Gay. could you please let me know where she came from in Georgia? For the lady who posted she was also descended from Asa Minor Laney thru this daughter Georgianna, please, please get in touch with me. Elaine Shelton, sheltonx2@suddenlink.net. You left no name or information so I could be in touch with you. I would love to be in touch with you. It is wonderful to read the replys and it makes us all proud for what has been done to preserve our history and this cemetary. My GGG grandfather was killed in the battle of Franklin, his name was Issac Jones from Mississippi. Can you check to see if he is buried there? Pvt. Jones of Co. A. 8th Mississippi Infantry is buried in the Mississippi Section 32, Grave # 156. I understand there is a privately published biography of the McGavock family. Is it available to the public, and if so, where can it be found? I also have wondered if the descendants are active in Carnton’s preservation. The novel, Widow of the South, held me spellbound. I have one ancestor who fought, but did not die, with the Confederate Army. I am an Ohioan by address and birth, but my maternal line comes from Virginia and West Virginia. I have a passion for history and couldn’t help but sense similarities in the battle of Franklin and the Scottish battle of Culloden, both in terms of the sense of what the outcome would be before the battles began and in how both signified the end of something held dear. My GG Grandfather, Richard Williams, Co G 25 Texas Calvary died 11-30-1864 and is buried at the cemetery. I have requested a photo of the CSA marker since we have no photo of him or his unit. Is there a listed of the Texans who are buried??? Did you ever receive any replies to your request for a photo of the Grave marker for Soldier Williams? I will be back at the cemetary shortly and would gladly look for and photograph the marker if you have not as yet received any replies to your request. I find both songs to be superb. I want to visit this cemetery some day. I have a great grand uncle who did not survive the Battle of Franklin. He is buried in the Confederate part of this cemetery. From the videos it is a very peaceful place. No wonder some of the deceased do not want to leave. They have found solace there in death that they could not find in life. My G Uncle is buried there at McGavock Cemetery in the Missouri section. He was Ed Chamberlain, 1st Missouri Cavalry Battalion, dismounted. I will be at the 150th reenactment in November.